Science can be tricky. Engaging the public in science can be trickier still. Today most people read the news in digital formats ‘on the go’ and rarely have time to digest complexities and weigh up uncertainties – the bread and butter of most research. Unfortunately scientific evidence is often pushed out of the media by stronger forces: politics, business, fear and even emotion. So how can scientists and science communicators engage the public in rational, insightful debates that focus on facts but also acknowledge that decisions and policies are rarely informed by impassionate, objective rationality? One group giving it a good go is the team behind @talkfracking – a movement to promote public discussion about fracking in the UK. This week the team are touring Britain – from Glasgow to London to Nottingham – and staging free debates to get the public to #talkfracking. On Wednesday I attended the Manchester event. My first impression was the size of the audience. In a conference room at the Radisson, the event attracted a full house. Clearly the promotional activities – an engaging website and a social media presence – had helped to spread the word. I guessed the full house also showed that passions are running high – and I wasn’t wrong. Yet throughout the event I was impressed with the way that the debate panellists commanded the attention of an audience that encompassed people of all ages. The debate began with a simple introduction to fracking that was easy to understand. Without this basic knowledge of the drilling process, it would be difficult to comprehend the dangers that were subsequently discussed. The simple introduction was essential. As scientists you should follow suit in remembering that your audience may be unfamiliar with your area of research. It may be tempting to launch into the juicy details, but take the time to introduce the topic – what it is, why it matters to them and why it matters now. However, assuming that you audience is new to the topic does not mean that you can assume they are stupid – far from it. Most audiences are intelligent: if they fail to grasp an idea poor communication is probably to blame. At Manchester the debate introduction brushed through fracking, its context in the UK, history in America and potential economic impact within a matter of minutes. But no one was left behind. The speakers spoke to the audience as equals – not yet experts on the topic but more than capable of rational, logical and informed thought and debate. It was a great example of how, with a bit of planning, science communication can be simple to understand whilst informative and never patronising. Following the introduction, and during the debate, the Manchester audience became nervous about what fracking may mean for our drinking water, health and economy. Some people shouted about drilling companies while others cheered campaigners and demanded answers from the panelists. As a researcher you tend to think about science objectively: emotion rarely gets a look in. But it is key to remember that emotional responses such as these are natural amongst the public; you must not look down on this. Indeed, when science clashes with emotion the research area is often catapulted into the media spotlight. Each member of the Talk Fracking team clearly thinks that fracking is an important, relevant and critically urgent topic. I don’t doubt that they could have talked for hours about the intricacies of the issue – but they did not. The debate worked because the panelists had just 3 minutes to present their views: no time to lecture or preach. Scientists should take note. If you want to engage a wide audience –stakeholders, the public or businesses – you must be concise. Too much detail can put people off and push the limits of their attention span. In order to achieve this, you should make a plan of the key points before you begin to write and keep the plan in mind. Do not allow yourself to deviate. 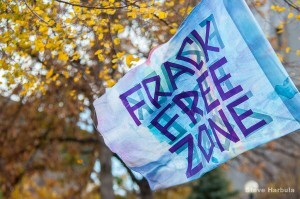 The Talk Fracking movement has lofty goals: to halt fracking in the UK. Having a goal is important to any communication campaign. You should know why you want to engage the public in debate and what you want to happen as a result. Do you simply want to educate your audience? Or do you want people to act upon the conclusions that they form? If you know why it matters and what outcome you hope to achieve, you will know which approach to take – TV interviews, open public debating, newspaper articles and so on. It remains to be seen if the public will engage with Talk Fracking beyond the debates and if the movement will sway public opinion. However I have been impressed with the communication efforts of the team who have brought attention to a topic that links science to politics and energy concerns. Of course, the communication was not flawless. Unfortunately the debate became rather one sided when pro-fracking industry representatives and local MP’s failed to make an appearance. I am not clear if geologists and environmental scientists were invited or made aware of the talks, but there were none present at the Manchester debate. 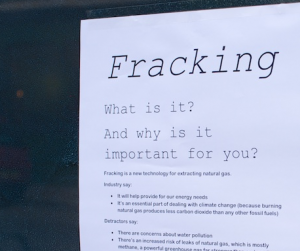 Unsurprisingly then, the audience rapidly became heavily against fracking – but perhaps this was to be expected. We hope that you find this deconstruction helpful. Please get in touch with your own opinions on this and other science communication events in Manchester, and do not hesitate to #talkfracking too!